Read a web-only essay, "Eleven Ways You Are Being Watched". Maps, as we know, help us find our way around. But they’re also powerful tools for someone hoping to find you. Widely available in electronic and paper formats, maps offer revealing insights into our movements and activities, even our likes and dislikes. 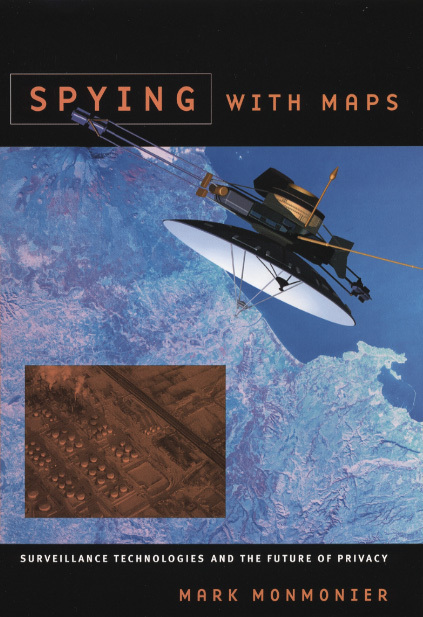 In Spying with Maps, the "mapmatician" Mark Monmonier looks at the increased use of geographic data, satellite imagery, and location tracking across a wide range of fields such as military intelligence, law enforcement, market research, and traffic engineering. Could these diverse forms of geographic monitoring, he asks, lead to grave consequences for society? To assess this very real threat, he explains how geospatial technology works, what it can reveal, who uses it, and to what effect. Despite our apprehension about surveillance technology, Spying with Maps is not a jeremiad, crammed with dire warnings about eyes in the sky and invasive tracking. Monmonier’s approach encompasses both skepticism and the acknowledgment that geospatial technology brings with it unprecedented benefits to governments, institutions, and individuals, especially in an era of asymmetric warfare and bioterrorism. Monmonier frames his explanations of what this new technology is and how it works with the question of whether locational privacy is a fundamental right. Does the right to be left alone include not letting Big Brother (or a legion of Little Brothers) know where we are or where we’ve been? What sacrifices must we make for homeland security and open government? With his usual wit and clarity, Monmonier offers readers an engaging, even-handed introduction to the dark side of the new technology that surrounds us—from traffic cameras and weather satellites to personal GPS devices and wireless communications.